How to measure it with DLS? What virus concentration is needed for reliable DLS size measurements? 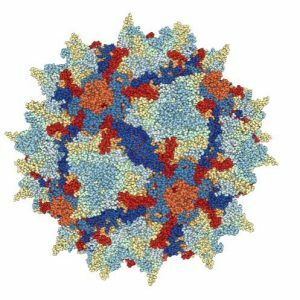 In cell biology, a virus is a self assembly of organic molecules (mainly proteins) in the size range 20 nm – 300 nm (diameter). 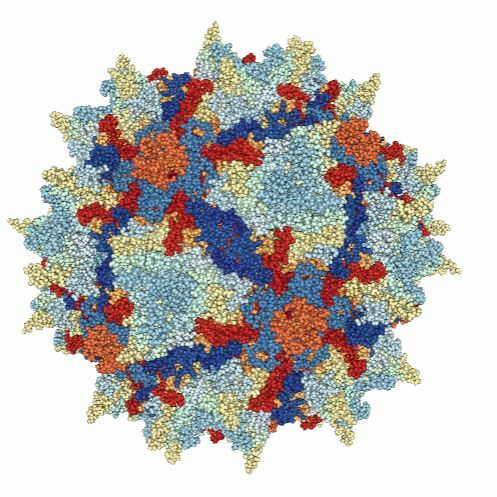 Viruses hold great interest for human gene therapy researchers, and the AAV-2 virus shown to the left is an example. How to size a virus in solution? One of the techniques available to size viruses (as well as other biological nanoparticles) is Dynamic Light Scattering (DLS), where intensity fluctuations in a small amount of sample are analyzed to obtain the diffusion coefficient and size distribution of the sample. The technique is applicable to a size range from ~1 nm up to a few microns; however, a minimum scattering signal strength must be achieved to obtain meaningful data. Malvern’s Zetasizer Nano software contains a calculator to help estimate the required minimum concentrations. Will ‘E11’ be enough to get good data? Virus concentrations are often specified in “E” numbers, indicating the number concentration of virus particles per mL of sample. For example, E11 would correspond to 1*10^11 particles per mL. As a practical lower size limit, let’s take a virus diameter of 25 nm. Within the Zetasizer software, under the ‘Tools’ – ‘Calculators’ – ‘Concentration’ utilities, the values for size, refractive index, the Zetasizer model, and attenuation level (11 is 100% laser power) can be entered, and then the expected scattering signal count rate is shown on the right half of the window. Aiming for at least twice the signal of water (~50kcps) in this case, the estimated minimum concentration would be 2.5*10^8 particles per microliter = 2.5*10^11 particles per mL. Thus, a concentration of E11 should work for just about any virus in a dynamic light scattering setup with the sensitivity of the Zetasizer Nano S.
To check the top size limit, we can change the radius to 150 nm to find significantly more scattering; however, the number of particles in the probe volume has now reduced significantly (only 100 particles in the scattering volume), and number fluctuations become a concern at lower concentrations. The number concentration for this scenario of large particles is E8. It is also possible to model the scattering for a traditional S90 system. For a setup with a 90 degree scattering angle, the calculator predicts a required concentration of E13 for the lower size limit and E9 for the upper size limit, reflecting the lower overall sensitivity of the configuration.